Image caption Charlie Evans said his car "was his independence"
A disabled man was left feeling "suicidal" after he had his adapted car taken away following changes to disability benefits. Charlie Evans, from Carmarthen, has relied on the Motability scheme since 1992 after being paralysed down one side following brain damage. The scheme entitles disabled people to lease a new car, scooter or powered wheelchair using part of their benefit. He said: "Without a car I couldn't go anywhere. It left me suicidal." Mr Evans, 58, told BBC Wales: "It was my independence. "I was so depressed. I didn't want to see anybody or talk to anyone for weeks. It's like taking away a member of my family. "I couldn't go out shopping, I couldn't go anywhere." After being unable to get a taxi or public transport to Cardiff, Mr Evans said he had had to buy his car for £10,000, and needed help from his partner. Asked if it had been expensive to buy with only benefits as income, he said: "It is, but I used up what savings I had. "It was taking my life away. My car is my life." Mr Evans, who suffered brain damage as a young man and struggles to express himself, appealed against the decision and had it overturned, so will be able to sell his car and return to the Motability scheme. But Disability Wales said up to 100 disabled people a week are having to return their adapted vehicles since the changes to disability benefits. The organisation said people who were no longer eligible were losing their independence. Changes in 2013 to disability benefits by the UK government scrapped the Disability Living Allowance and replaced it with a new working age benefit for disabled people, Personal Independence Payments (PIP). Those who qualify for the higher level of PIP support can lease a car, scooter or powered wheelchair in exchange for their mobility allowance. It also includes free insurance, servicing and maintenance, breakdown cover and replacement tyres. Miranda Evans, director of Disability Wales, said: "Public transport is often inaccessible to disabled people. "A vehicle is a must; without that they lose their independence." Motability does offer support packages of up to £2,000 for long-standing scheme members to buy their own cars back, and help towards the cost of fitting new adaptations. But the costs are still considerable for those on a low income. 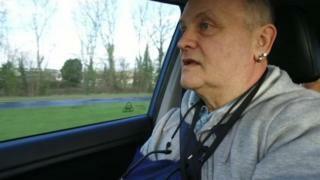 George Lockett, 63, from Nantlle, near Penygroes in Gwynedd, said the reassessments were "destroying people's lives". He used three credit cards to buy his own vehicle back at a cost of £6,500, and says he has spent an additional £1,000 in servicing costs since he had to leave the scheme. Mr Lockett has been waiting 18 months to have his second appeal heard. "I'm pretty certain it's costing the UK government more with all the appeals and all the stress that it causes," he added. Appeals against PIP payments now make up the largest number of social security tribunal cases dealt with by the Ministry of Justice. In 2016-17 there were 79,943 cases heard and 65% of those decisions found in favour of the claimant. The Department for Work and Pensions said: "PIP is a better benefit which takes a much wider look at the way an individual's disability or health condition impacts them on a daily basis. "Under PIP, 29% of claimants receive the highest rate of support compared to 15% under DLA."